What are the steps to designing successfully with CFS framing? While there are many steps to doing it right, here are six to start with. Getting ready to design a cold-formed steel (CFS) framed building? You’ve made a great choice for a resilient system that will deliver years of quality performance. But where should you begin? 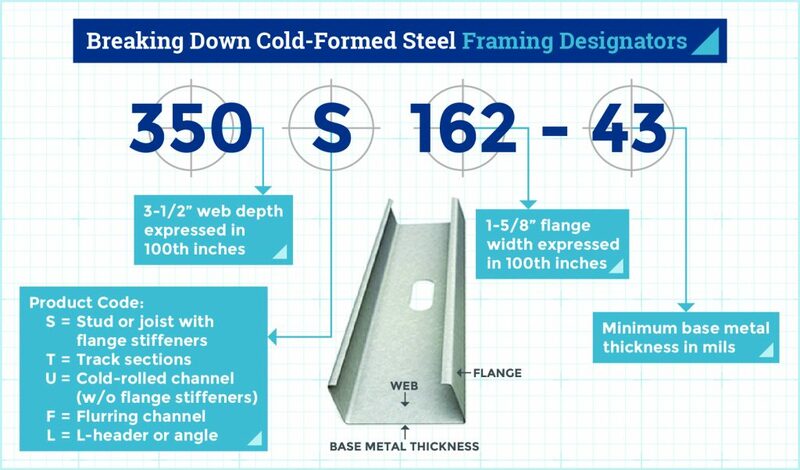 What are the steps to designing successfully with CFS framing? While there are many steps to doing it right, here are six of the most critical. Start by having a conversation with officials in your local building department. If needed, provide them with resources like the American Iron and Steel Institute’s (AISI) cold-formed steel framing standards, which are available to download free of charge at www.aisistandards.org. That’s the best way to uncover the particular requirements that relate to your project and will help it move along smoothly. “International Building Code and International Residential Code,” recognized as the governing building codes by most building departments in the U.S. In general, the codes reference CFS framing standards developed by AISI, including the AISI S100 and S200 series of design standards. These are available for free download at www.aisistandards.org. •The American Iron and Steel Institute’s online Steel Store has additional resources, such as design manuals, guides, and earlier versions of AISI S100, “North American Specification for the Design of Cold-Formed Steel Structural Members,” available for purchase. •The Steel Framing Industry Association (SFIA) offers webinars on CFS design. For example, the webinar, “FAQs on Cold-Formed Steel Design: What Everyone Needs to Know,” discusses fastener connection strength, installation tolerances, yield strength, bridging and bracing, and other design issues. •The Cold-Formed Steel Engineers Institute (CFSEI) offers webinars on many CFS design-related topics and a library of published technical notes that are available for purchase. New energy codes require continuous insulation on all exterior CFS-framed walls. These changes came with the 2009 and 2012 International Energy Conservation Code® (IECC). The latest codes — 2015 IECC and ASHRAE Standard 90.1-2016, “Energy Standard for Buildings Except Low–Rise Residential Buildings” — maintain stringent insulation requirements. •Windows, doors, and light fixtures that once attached directly to CFS framing must now factor foam insulation into their attachment systems. Special extensions may be needed. •Fasteners must support not just the exterior cladding, but the continuous insulation as well. So, take time to verify the energy-efficiency provisions in place locally and their impact on CFS systems. •A military project may require blast resistance as a structural feature. •An industrial building may need progressive collapse resistance included in its design. •The design of such additional requirements may be performed by a specialty designer or CFS component designer. In such cases, the building designer must specify the design criteria, design load parameters, level of protection, and other details. Check AISI S202-15, “Code of Standard Practice for Cold-Formed Steel Structural Framing, 2015 Edition,” which is available for free download at www.aisistandards.org. AISI S202-15 addresses trade practices for the design, fabrication, and installation of cold-formed steel structural framing products. You do not need an engineer to design a two-story above-grade structure using the prescriptive method, but some jurisdictions may require an engineers’ stamp. AISI S230-15, “Standard for Cold-Formed Steel Framing―Prescriptive Method for One- and Two-Family Dwellings, 2015 Edition,” is available for free download at www.aisistandards.org. •The first three numbers represent member depth in 1/100 inches. •The letter stands for member type — S for stud, T for track, U for channel sections, and F for furring channels. •The second three-digit number stands for the flange width, again in 1/100 inches. •The last number represents member thickness in “mils” or 1/1000 inches. The last number, thickness, is important. The “43” above represents a 43 mil or 0.043-inch- thick CFS stud. However, this thickness represents minimum delivered thickness — not design thickness. Industry practice recognizes that the minimum base metal thickness represents 95 percent of the design thickness. This is explained in AISI S240-15, “North American Standard for Cold-Formed Steel Structural Framing, 2015 Edition,” which is available for free download at www.aisistandards.org. Section A5, “Products,” discusses product designators, base steel thicknesses, manufacturing tolerances, and other requirements for CFS framing common to prescriptive and engineered design. •CFS panelization can save time and costs, and can improve quality control. •Many CFS panel and truss manufacturers provide engineering services and work straight from the architectural drawings. •Some CFS panel manufacturers offer turn-key solutions by including product installation. Of course, CFS panels built in a factory require engineered drawings and layouts for building code approval, just like any other premanufactured structural component. Plan checks are helpful. The reviewer at your local building department can verify that your CFS framing designs are accurate and in line with local code requirements. As you move through these six steps, keep in mind that BuildSteel experts are available to help with projects in the United States and Canada that use CFS framing. The BuildSteel team can answer questions and review information related to low-rise, mid-rise, and multi-family CFS construction. So actually, there’s a seventh step: Contact BuildSteel for complimentary project assistance.